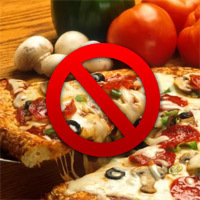 Don’t get me wrong… I love eating pizza and need to get my fix every once in a while. However, if I have to go to another birthday party where they serve pizza, I think I’m going to explode. I know that it makes life easy, is relatively inexpensive, is readily available, is easy to clean up, and is usually fun for kids to eat. However, where has the creativity and diversity gone? Yes, there is a time and place for it…just not all the time! Alright all you parents out there. I know you’re busy and strapped for cash but don’t forget we kids can help out too. Not that I’m trying to tell you what to do, but please change it up every once in a while. It makes for a nice surprise and your guests will appreciate it. Believe me, having three younger siblings, I’ve gone to my share of parties, so I’m pretty confident I can give you some idea of what works and what doesn’t — what might save you money and what’s just a flat out flop that you won’t be able to give away at the end of the party. So the last thing we want is to sit down at the table for a formal meal, unless of course it’s birthday cake and dessert time. First of all, kids want things that are bite sized and simple. We want things that we can just grab and eat on the move. Our focus is to have a good time and chat with our friends. We might even forget to eat for that matter. So the last thing we want is to sit down at the table for a formal meal, unless of course it’s birthday cake and dessert time. That’s the only time you’ll see us gathered at the table in an orderly and civilized manner. Keep in mind some factors to consider when you are preparing: Is this party for adults, kids, or both? Will the guests have certain dietary restrictions such as those for religious and/or health purposes? Depending on the occasion the web is filled with suggestions of dishes you can make, whether you’re health conscious or on a tight budget. With the diversity of cultures that co-exist in our schools and general society today, parties are a great opportunity to celebrate our differences and teach your guests about your culture. My suggestion is to serve dishes that are specific to your heritage. Food can create that fun environment, which promotes discussion, curiosity, and learning. Your guests will appreciate your extra efforts and for sharing a part of your culture with them.